Also see understanding credit basics. Local Banks — Each bank will have its own set of unique mortgage products and programs. 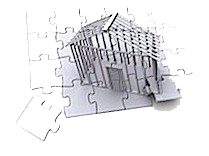 Mortgage Brokers — represent a variety of lenders and can draw from a range of products. Real Estate Office — Some offices offer lending services, often through a Mortgage Broker. Typical conventional mortgages will require 5% down, plus 5 to 7% closing costs for a total of 10 to 12%. Special lender and government programs may lower the cash required for qualified, first-time home buyers, but total cash to close will rarely be less than 5%. Your purchasing power is affected by many things, such as your income, non-housing debts, real estate taxes and credit scores. Generally, people with good credit and low non-housing debts can afford a home priced at 2.75 to 3.0 time their GROSS (before taxes) annual household income. For example, a couple making $60,000 per year might be able to afford a home between $165,000 and $180,000.